From off-line batch processing to fully automated in-line manufacturing systems, we offer an unrivalled choice of impregnation process equipment and automation options to ensure our system meets your production requirements. 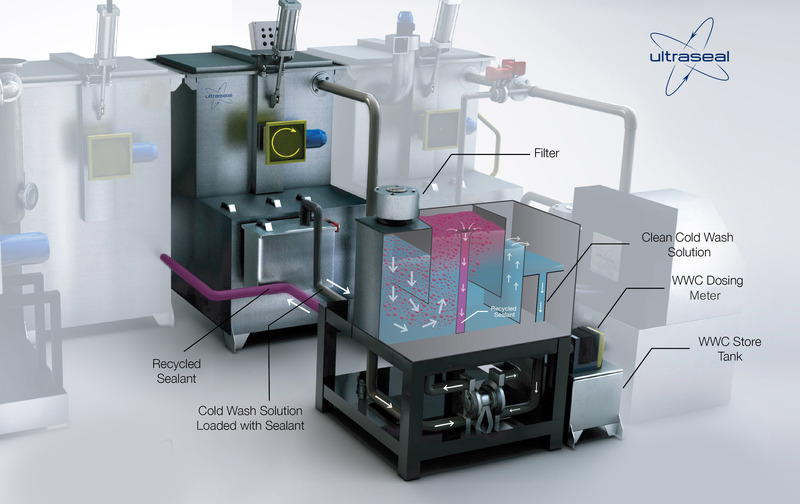 Our impregnation systems can be specified with Ultraseal Recycling Technology and Recycling sealants providing best-in-class sustainability with greatly reduced sealant consumption, water consumption and effluent waste. In addition to fully or semi-automated standard systems, we also offer custom engineered solutions to meet your individual requirements, all backed by worldwide after sales and service support from the market leader in impregnation sealants, equipment and service. Whatever your needs, we can meet them completely. Faster, consistent cycle times and production flexibility with front-load conveyor or robotic component handling. From simple batch processing for lower volumes to advanced semi-automated options, Ultraseal offers an unrivalled choice of impregnation process equipment options. Find out more about our best-in-class Sealant Recycling Systems. Discover everything you need to know about porosity sealing and impregnation technology. Ultraseal’s patented Sealant Recovery System (SRS) can be installed onto most standard impregnation systems. Approved by manufacturers worldwide, Ultraseal’s recycling sealants offer the ultimate sustainable solution to sealing porosity in cast components.